NANJING - F.C. Internazionale Milano (Inter Milan) and Suning Holdings Group today announce the signing of a strategic partnership. Suning Holdings Group will acquire a majority stake in Inter Milan, one of Europe’s leading football clubs since its founding in 1908.
International Sports Capital will become the sole minority shareholder in the Club and Erick Thohir retains his position as President of Inter. Internazionale Holding will cease to be a shareholder and former President, Massimo Moratti, will exit the Club after many years of success winning prestigious silverware including the “Triplete” in 2010. Inter President, Erick Thohir, commenting on the acquisition, said: “This new partnership with Suning Holdings Group is a game changer for Inter Milan. Over the past two and a half years we have been building on the existing solid base at the Club and this new partnership will enable us to take the next step in the project and return Inter Milan to its rightful place in world club football. 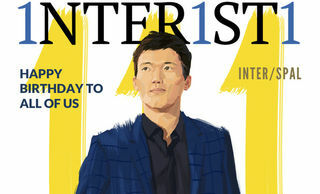 Suning Holdings Group will continue to support the global business strategy of Erick Thohir and his senior management team in order to make Inter Milan even stronger and more competitive, both on and off the pitch, by investing in the core business and expanding the brand’s geographic reach, notably in China and Asia. The partnership represents a ground breaking level of investment in Italian football and will allow Inter Milan to re-establish itself among the top ten clubs in football targeting consistent qualification for European Club competitions. With regards to the future development of Inter Milan, Mr Zhang stated: “This is an unprecedented opportunity for Inter Milan to grow further in China, and China will become the second home of Inter Milan. In addition, Suning’s capital investment and abundant resources will enable Inter Milan to return to its glory days and become a stronger property able to attract top stars from across the globe." Inter Milan boasts one of the richest palmares among European Clubs and ranks as one of the top ten global brand names in football. Suning Holdings Group, in connection with their e-commerce group Suning.com, will help provide access to the 130 million Inter Milan followers in China and has expertise in developing platforms to engage directly with the Club’s fans across the world. The combination of Suning Holdings Group and Inter Milan will lead to the development of strategic initiatives and new levels of excellence. Inter Milan was founded on the principle of “Brothers of the World”. This new partnership continues in this long tradition of the Club. Suning was founded in 1990 as a small-sized business. Rooted in its entrepreneurial spirit, and through decades of expansion and transformation, Suning now ranks among the top three Chinese non-state owned enterprises with close to $50 billion in annual sales. At present, Suning has two listed companies, at home and abroad. With more than 1,600 chain stores covering over 600 cities in China, Hong Kong and Japan, Suning strives to continue its rapid growth across six vertical industries. They include: Retail, Real Estate, Sports, Media and Entertainment, Investment, and Financial Services. Founded in 1908, Inter Milan is globally renowned as one of the world's most successful football teams. Erick Thohir has been president since 2013. The club's trophy haul includes 18 Italian league titles, 7 Coppa Italias, 5 Italian Super Cups, 3 UEFA Cups, 2 European Cups, 1 UEFA Champions League, 2 Intercontinental Cups and 1 FIFA Club World Cup. Inter Milan is one of the seven teams to have done the treble – Champions League, National Championship and National Cup – in the same year (2010), and the only Italian club never to have been relegated in its 108-year history. Inter Milan is a global brand with more than 250 million supporters worldwide. Inter Milan's home is the Stadio Giuseppe Meazza, a 78,326-seater arena that is among the world's most famous and frequently visited stadiums (over four million tourists each year). The stadium hosted this year’s UEFA Champions League Final. FC INTERNAZIONALE - PRESS CONFERENCE - LIVE STREAMING! Zanetti: "Start of a big future"